When a bizarre love tangle causes 17-year-old Wyatt Hillyer’s parents to jump off different bridges within a few hours of each other, the tone of Wyatt’s life seems set. At the same time, so is his immediate course: he must pick up sticks and go to live in a sma ll town with his uncle and aunt and their gorgeous daughter. 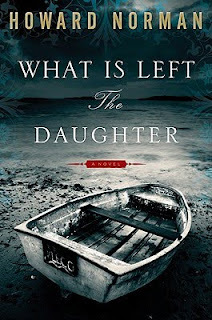 Despite what could certainly sound like a farcial set up, What Is Left the Daughter (Houghton Mifflin Harcourt) is a searing look into the hearts of the characters author Howard Norman builds for us so skillfully. What Is Left the Daughter is a slender book that, nonetheless, packs a surprising punch. Norman’s novel seems oddly weighty at times. Important. As though there are thoughts and lessons being imparted that the reader should pay close attention to.